DAAM School of dance is taking bookings for our Summer Camp next year, January 4th-21st, 2017. 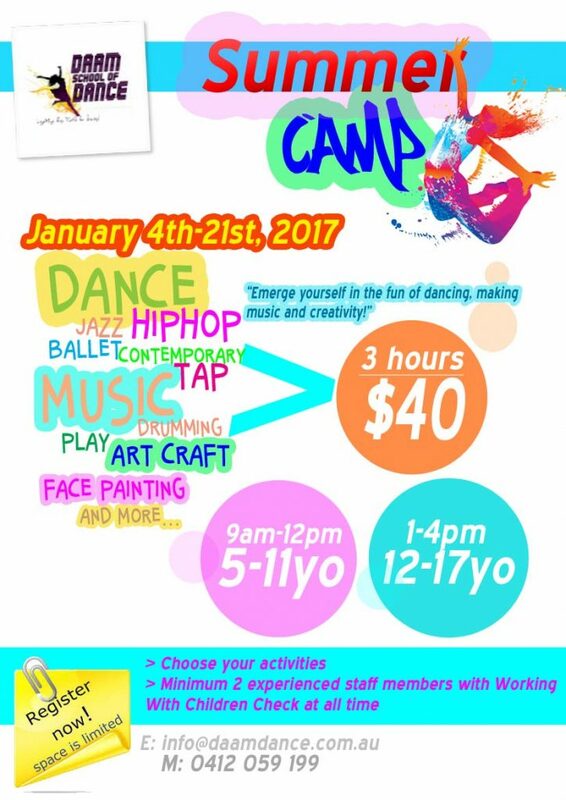 Limited space available for an exciting 3-hour program full of music and fun dance workshops, art craft activities, face painting for kids, drumming etc. For both dance and non-dance students, we also offer small health, wellbeing and safe dance practice session. Choose your favourite activities and dance styles. We offer 2 experienced and qualified staff with Working With Children Check onsite at all time. Book early to reserve your kids’ spots! Group bookings are also welcome!